On the morning of September 11th we drove to Mt Rushmore without expectations. Mostly I think we were answering to a routine tourist call as Mt Rushmore is one of the most iconic tourist destinations in the United States. What we found when we arrived surprised me. The original sculpture was proposed in 1927 to promote tourism to the area. 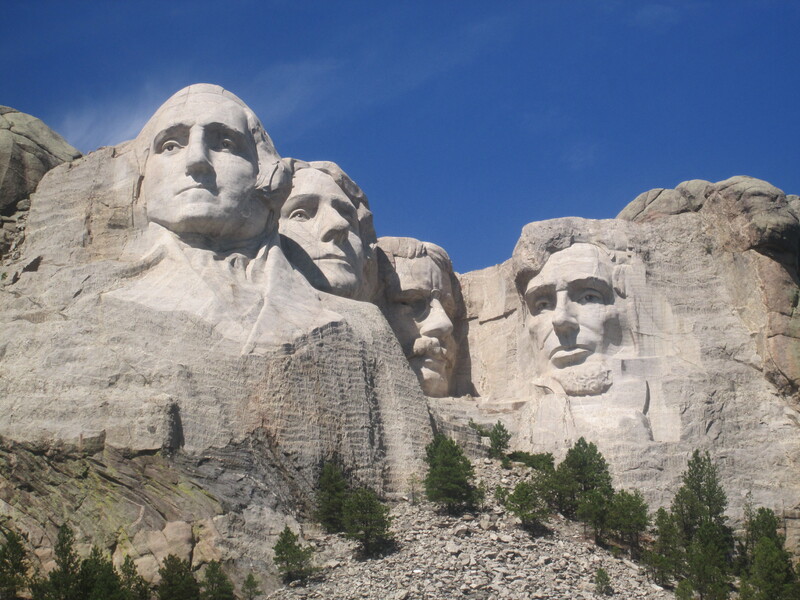 Originally it was proposed to feature both native and non native western heroes but gained more nationwide support and interest upon the idea of featuring the four presidents. The symbolism of these presidents have led to not only what has made this country strong and innovative but what has allowed the United States to be one of the most significant single influences in the world through the 19th and 20th centuries. To begin with both Thomas Jefferson’s and George Washington’s time of influence straddled the precarious time of our country’s birth. It could be argued that the US was lucky that it came into being during a time when these defining characters existed although I think that the US came to be because of the strength of character and clarity of these individuals. This document and every word that was carefully crafted in it was so essential in galvanizing the faith and identity of the new nation that when General George Washington read the Declaration to his troops in New York City on July 9, with thousands of British troops on ships in the harbor, crowds began tearing down and destroying signs or statues representing royal authority. 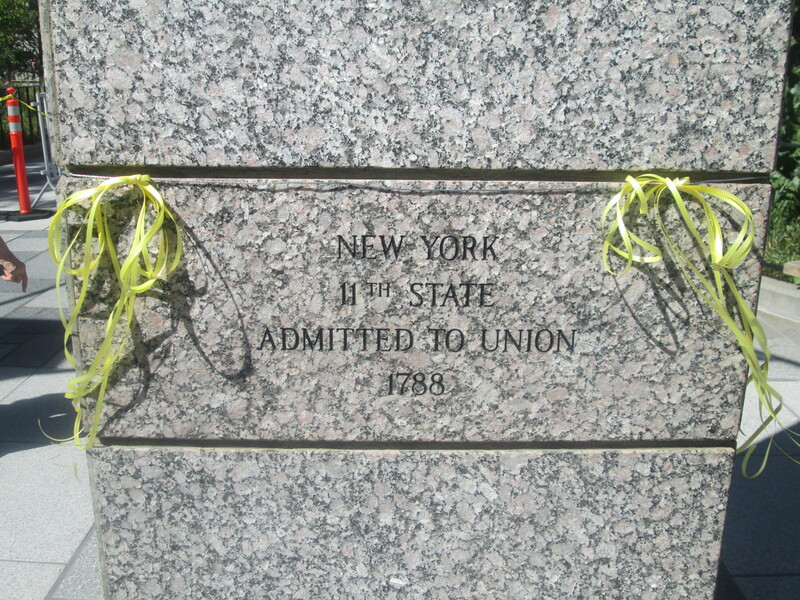 This strengthened sentiment spread quickly through the new nation leading to an equestrian statue of King George in New York City to be pulled down and the lead used to make musket balls. By November of 1776 circulation of the document spread through Western Europe which inspired popular support in France leading to them becoming a key ally in defeating the British. After leading the country to officially defeating the British in 1783 by 1889 George Washington received 100% of the electoral vote as the first president. Leading with clear sights toward the common good and impeccable example that transcended into our foundational principles, Washington knew more than anyone the importance of his every decision which included putting the Constitution of the United States into practice. He would eventually step down after two terms in office in order to set the precedent as a leader of civil servitude, staunchly opposing dictatorship and tirelessly warning against partisanship in government. Washington’s commitment to “the common good” lead him to free all of his slaves upon his death. As a president of a new nation our third president Thomas Jefferson knew the importance of establishing our geographic boundaries. Jefferson bought the Louisiana Territory for 15 million dollars from Napoleon which kept the US out of the raging European wars of the day, but kept us in favor with its biggest power and potential threat, Napoleon. Jefferson knew that the current boarders were only a piece of what would later identify our borders. With this in mind he personally trained Meriwether Lewis in preparation to lead the Lewis and Clark expedition and explore what lay beyond the known Frontier. Jefferson’s Legacy did not stop after his presidency though. Thomas Jefferson became almost exclusively devoted to education, believing that all children of a great nation should have access to free quality education. Jefferson helped spearhead the separation of religion and science in education by creating the University of Virginia at the base of his home Monticello. This signaled the beginning of a state run University System founded on these principles. Abraham Lincoln was the tipping point that allowed the country’s greatest moral crisis to explode. The Civil War happened because the nation was sitting on “a volcano” of yet unchecked ethical dilemma and he was the uncompromising hand that was needed. It was Lincoln that defined the birth of the country as July 4th 1776 based on the nation’s realization that we were conceived on the understanding that “all men are created equal”. For Lincoln both slavery and the fragmenting of the nation were unacceptable and that “government of the people, by the people, for the people, shall not perish from the earth”. In April of 1865 while campaigning for voting rights for African Americans Lincoln was assassinated by John Wilkes Booth, almost instantly turning him into a martyr of almost god like proportions. He pushed forward and popularized the importance of countless issues including women’s rights and perhaps his most popular and renowned legacy was his leadership towards branding the United States as a place where wilderness and the environment was an essential part of the American heritage, stating that “We have become great because of the lavish use of our resources…..It is also vandalism wantonly to destroy or to permit the destruction of what is beautiful in nature, whether it be a cliff, a forest, or a species of mammal or bird. Here in the United States we turn our rivers and streams into sewers and dumping-grounds, we pollute the air, we destroy forests, and exterminate fishes, birds and mammals — not to speak of vulgarizing charming landscapes with hideous advertisements. But at last it looks as if our people are awakening.” With that said Roosevelt wasted no time doubling the size of the National Park system and setting a precedent towards a popular movement of conservation which to this day is a key part of in American identity. 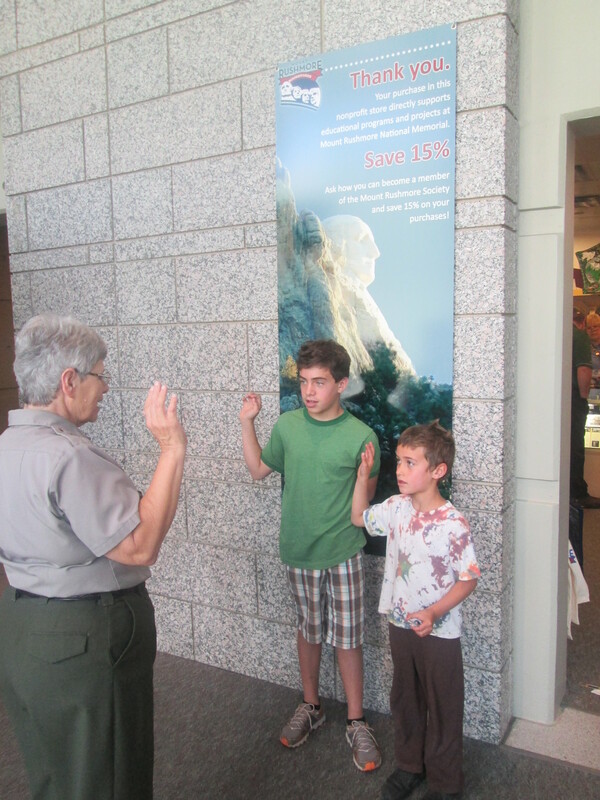 As we drove east from Mt Rushmore and settled into the vast grassy landscape Jacob and Elias’s curiosity was spiked with countless questions on what it meant to be part of this country. I think the young minds were mostly inspired by the magnitude of individuals chosen for this iconic monument. It occurred to me that these individuals were not ahead of their time but instead they have helped define the time. What they stood for and accomplished was and will always be relevant on a timeless scale. Upon Mt Rushmore’s completion in 1941 the principles it represented would help guide not only America during the trial of worldwide virtue through World War II, but it supported in putting us at center stage while the world looked to us for guidance in our quickly changing world into the 21st century. 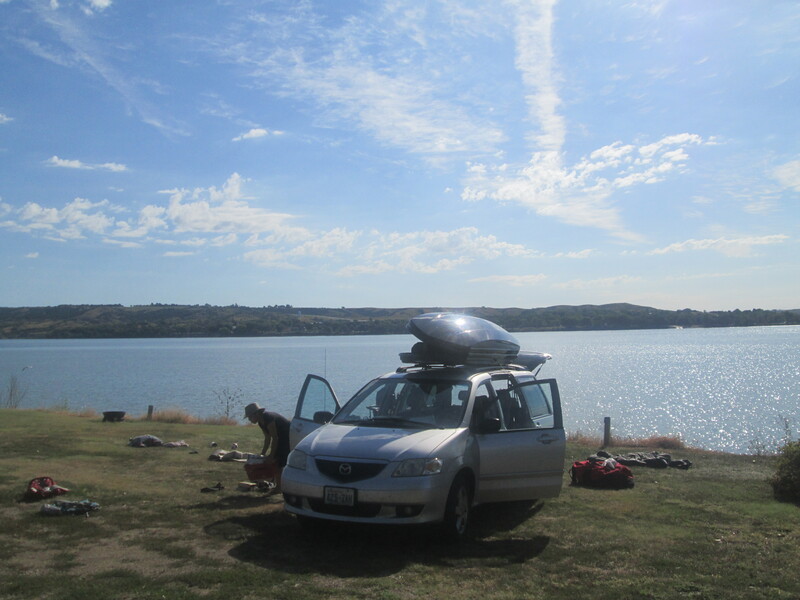 That night we settled down at a wonderful camp mid way through South Dakota on the Missouri River. As we watched the sunset and imagined Lewis and Clark pushing up river for the first time I looked across at the increase in deciduous trees and was excited about our next stage of our journey spending time with our friends in Wisconsin.